Mardi Gras in February is celebrated in different ways all over the world, but the festival is perhaps most synonymous with New Orleans. I visited New Orleans as part of a US road trip in September - you can read my travel review here - but while we missed Mardi Gras, we were able to see behind the scenes at Mardi Gras World. Essentially a factory tour, we were able to see the floats and giant centrepieces of the parade being built and painted. Our visit began by watching a film explaining the origins and workings of the parade and we were able to try on some costumes, and eat some King Cake. King Cake, we were told, is eaten from epiphany until Mardi Gras, and represents the three kings who went to visit the baby Jesus. It is made from a sweet dough that is sprinkled with cinnamon and sugar and rolled up into a ring or crown shape, then always decorated with the same three colours - purple, which symbolises justice, green, which represents faith, and gold for power. I found it quite amusing that in the same way that traditional English Christmas puddings contain a silver sixpence, bringing luck to the person who finds it in their portion, King Cake for the same reason contains.. a little plastic baby Jesus. I saw packet mixes for the cake which proclaimed on the front of the box "complete with plastic baby". Quite. I decided to make a King Cake this month for Mardi Gras and to remind myself of my trip to New Orleans, but I was a bit delayed as I ordered the sanding sugar in the correct colours online - from different sellers - and the gold never turned up! I found I had some yellow at home already but it was about 10 days after Mardi Gras by the time I got around to making this. You know how your mother or school teacher always said "make sure you read the recipe properly first?" Mary Berry always advises that on the Great British Bake Off technical challenge as well. I feel that I've properly learnt my lesson after searching for a King Cake recipe online and choosing this one from My Recipes.com. It was only as I added the flour - one of the last ingredients - that I thought the quantity of ingredients seemed a lot, and went back and looked at the recipe again. And saw at the top it said "makes two cakes". Why? Why would you do that? This isn't a cake where you bake two layers and sandwich them together - you literally end up with two separate cakes. One for you, and one for a friend I guess! By the time I realised it was too late, so I did indeed end up with two cakes. It was very easy to roll out - pliable but not too sticky. I sprinkled the top with sugar and cinnamon though in retrospect I would have used more. After baking in the oven it is very puffed up! The King Cake in all its glory, complete with Mardi Gras necklaces and a mask I bought in New Orleans. The cake was delicious - it reminded me more of an iced bun as it's a milky sweet pastry rather than a cake really. I didn't put a plastic baby into mine but I think it's none the worse for it! I'm sending this to Love Cake, hosted by Ness at JibberJabberUK. 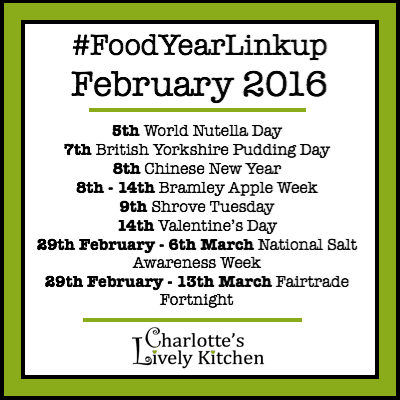 I'm also sharing it with the Food Year Linkup, hosted by Charlotte's Lively Kitchen. I love recreating recipes from my holidays! This cake does sound delicious - like a much more impressive and colourful iced bun! Just had a look at the recipe and it sounds just like out sort of thing, I've added it to my ever growing to-make list. I'm not too sure where I'd get hold of a small plastic baby Jesus though, I may just leave that step out! What a wonderfully fun and colourful cake. I love traditionally bakes from around the world.